This recall involves the Bump and Go Action Egg Laying Chickens with lights, music and bump and go action. 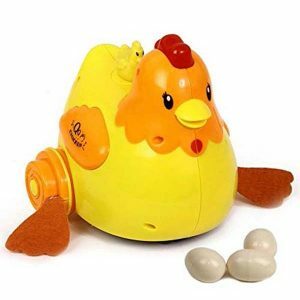 The battery-powered plastic toy was sold in two styles – a yellow chicken with an orange head and wings and a multi-colored (yellow, green and orange) chicken. The chicken toy includes three white plastic eggs that are placed into the back of the chicken, and then released from the bottom. The yellow-colored chicken measures 7 inches wide by 6 inches tall by 7 inches deep. The multi-colored chicken measures 7 inches wide by 5 inches tall by 4 inches deep. The eggs for both toys are one inch wide by one inch tall by one inch deep. The U.S. Consumer Products Safety Commission issued a recall alert on August 30, 2016 for the Egg laying chicken toys. REFUND – Consumers should immediately stop using the recalled toys and contact the firm for a full refund. Dazzling Toys is contacting consumers who purchased the recalled toys. Online at www.amazon.com and www.ebay.com from February 2016 through July 2016 for about $12. Dazzling Toys toll-free at 844-222-2812 between 9 a.m. and 5 p.m. Monday through Friday ET, email recall.dazzlingtoys@gmail.com or online on Dazzling Toys homepage at www.dazzlingtoys.com for more information.